My first order of business is to express my sincere gratitude to Dr. Hunter Baker, Dr. Ray Van Neste, and all the wonderful people at Union University, Jackson, Tennessee, for making me so extremely welcome for the last couple days. It was a tremendous experience for me. I hope it was enjoyable for innocent bystanders as well. I flew in to Memphis, courtesy of the school, on Monday. Dr. Hunter Baker met me, in two senses. He’s one of those people I’ve known online for years, but we’d never actually been in the same physical space before. He took me out for pizza (very good), and then back to the school for a short tour. That’s when I also got to meet Dr. Ray Van Neste, another online friend and the co-conspirator in my invitation. They’re both deans. When you’re a dean, you can get away with spending institutional funds on marginal literary figures. Tuesday was the most intense day I’ve experienced in a long time. It’s hard to describe. Hunter told me I wasn’t like he expected, based on my self-descriptions on this blog. And he was right. I was in a different reality on Tuesday. I was “on,” as in performing. Like when I used to act. In retrospect, I’m not at all sure why I decided it would be a good idea to wear my frock coat, vest, and tie when I visited classes on Tuesday. Especially when I pulled out my monocle for reading, it must have made me look distinctly bizarre. But it somehow made sense to me in my altered state of consciousness. I sat in on Hunter’s Modern Political Thought class that morning, discussing medieval political thought. Seemed to go OK. In the afternoon I joined a writing class, and that was quite a bit of fun – or at least the alien intelligence possessing my consciousness thought so. All day I was in performance mode, and people enabled me by asking me questions on subjects about which I had something to say. These elements combined to make me appear to be an extrovert. The real me just hung on for the ride. Lunch that day was one of the best hamburgers I’ve ever had, at a local place, and for dinner we joined another dean (whose name I’ve forgotten, I fear) for a memorable meal at the nicest place in town. My alien possessor handled this well, I believe. 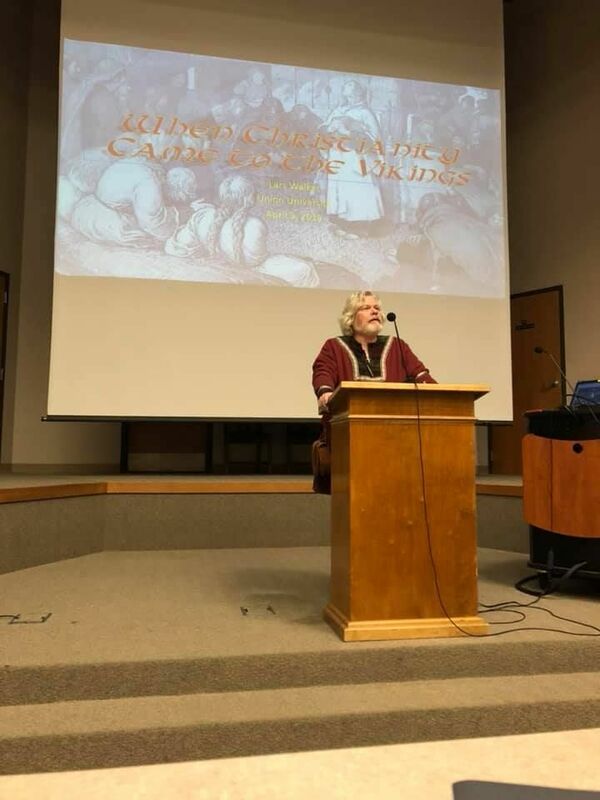 Then in the evening, I did my big presentation on “When Christianity Came To the Vikings.” I am pretty much unable to tell you how it went, because my grandiose half thinks it was awesome, and my neurotic half thinks I messed it up completely. The truth, no doubt, falls somewhere in between, but where on a scale from one to ten, I can’t tell you. They inform me the video will be posted, and I’ll share it with you. But I will never have the nerve to watch it. I do know I knocked my water bottle off the podium. Could have used that water. There were a number of questions afterward (always a good sign), and one fan who wasn’t a student or faculty member drove a distance to be there (nice to meet you, Steve). Then I returned to my guest room and crashed, feeling as if I’d gone nine rounds with a prizefighter. And Wednesday I flew home. It was a perfect spring day in Tennessee, and in Minneapolis we were having a snowstorm. And that’s my latest adventure. It’s good to be a celebrity. The life of a collegiate lecturer, what a fount of vitality and benevolence. I wish I’d had the day or two to get out there. I’ll bet you provided some real imaginative refreshment. It was good of you to go.